Falvey Memorial Library :: Fully described: Irish Catholic Benevolent Society papers. Fully described: Irish Catholic Benevolent Society papers. Digitized last year, the Irish Catholic Benevolent Society papers is now fully described. This collection is part of the Historic Papers owned by the American Catholic Historic Society and housed at the Philadelphia Archdiocesan Historical Research Center. Containing both printed and manuscript materials, this 122 item collection documents the activities of a number of Philadelphia-based Irish societies. These voluntary associations brought together new immigrants and citizens of Irish ancestory for fellowship as well as mutual economic aid often in the form of group insurance. 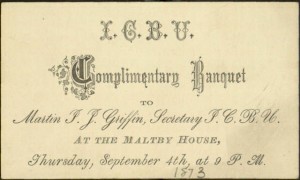 The bulk of the material covers the years 1885-1892 and contains correspondence, proceedings, reports, circulars, and even invitation cards to social events, like this one to a 1873 banquet in honor of Martin Griffin.